There’s a lot happening currently so we thought we should pause for a moment to review a few of the major news stories and highlight whats on tap for the coming week. $32 million redevelopment of the historic Massasoit Block and Paramount Theater on Main Street, just two blocks from Springfield Union Station. This is very big news for Springfield, and the redevelopment of the area near Union Station. The Canadian bill, which among other things, would allow for the establishment of a preclearance facility at Montreal Central Station. With some luck the bill will be approved by Parliament this summer so that the long discussed plan to extend the Vermonter to Montreal can move forward. Newly laid track at the CRRC factory in Springfield, Ma. Continued progress at the CRRC rail factory in Springfield. Senator Eric Lesser travels from Boston to Springfield, with stops in Framingham, Worcester, Palmer and Springfield, on a ‘whistle-stop’ tour to promote expanded East-West passenger rail service. Here’s a summary of Monday’s westbound-only schedule. 11:00 am in Framingham – Press conference at Framingham MBTA commuter rail station with Sen. Karen Spilka and local elected officials to discuss the regional and state-wide importance of modern rail infrastructure and concerns about the Framingham at-grade rail crossing. 12:30 pm in Worcester – Meeting with Senate Majority Leader Harriette Chandler and the Editorial Board of the Worcester Telegram & Gazette to discuss how expansion of MBTA rail service to Worcester has transformed the city. 3:30 pm in Palmer – “Rally for Rail | Palmer” event and meeting with Sen. Anne Gobi and local business leaders at Palmer’s Steaming Tender Restaurant to discuss Transit Oriented Development opportunities for the town and region. The rallies in Palmer and Springfield are open to the public and we would encourage people to attend. 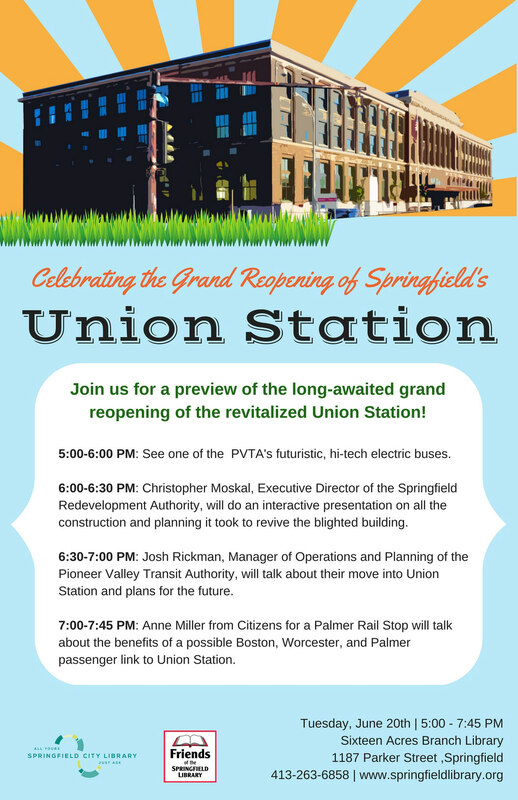 A special evening program at Sixteen Acres Branch Library, 1187 Parker St, Springfield, on the long-awaited grand reopening of the Springfield Union Station. • Little Hands on the Move – Explore the city streets and landmarks of the Springfield Cultural District using wooden cars and motorcycles on a giant carpeted map. • Early Transportation Please Touch Table – Put on your white curator gloves and touch car parts from a century ago. • Marble Run – Use plastic, wood, recycled, and even illuminated materials to create twists and turns to see how far you can get your marbles to roll. • Make & Take: Union Station Themed Buttons – Color a train, bus or Union Station Grand Opening logo then have it made into a wearable button. • Appearance by the Cat in the Hat – Meet and greet with the Cat from 11:30 a.m. to 1:30 p.m.
And yes, Trains in the Valley will be at this event with its own table. Please stop by and say hello! 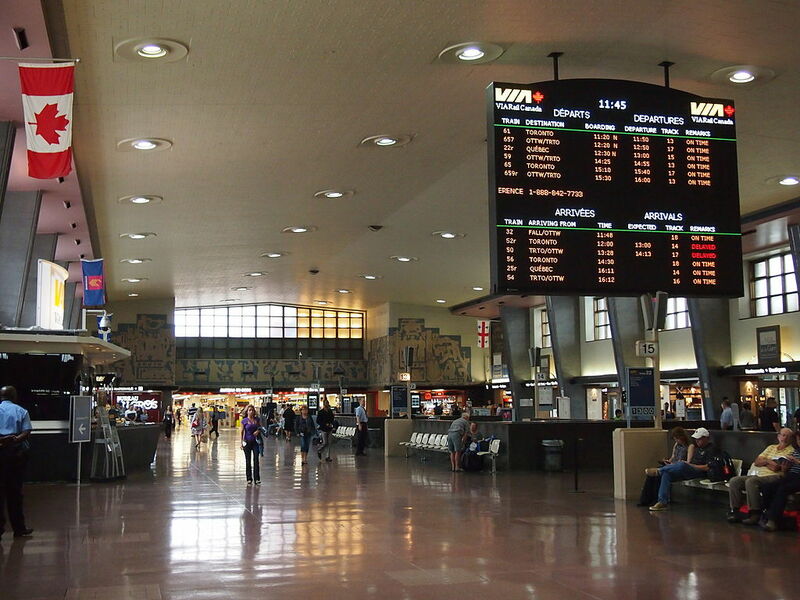 The Pioneer Valley Transit Authority (PVTA) shifts its regional bus hub to Springfield Union Station. Details can be found on this link to the PVTA website.